You are at a bar enjoying a relaxing moment and suddenly the beauty appears in front of you! This is the moment that you wished you had already read the following tips on how to approach a girl at a bar. You’re sitting at the perfect place that gives you full access to the beauty you can’t stop staring at. You just need to make a move, fast! How will you do it? What things you should avoid? What are the perfect moves you should do? Be charming and confident, but before your first move you should be aware of the things a girl looks for in a guy and keep in mind the questions you should make to uncover her intentions. While there may not be a one-size-fits-all suggestion, the following are the dos and don’ts on how to approach a girl at a bar. A man worth having a girl’s friendship should be confident enough to speak to her himself. Do not send a friend to speak on your behalf. She is not a teenager, for crying out loud. Neither are you. As an adult man with a mouth, walk and speak to her. Feeling fearful does not mean you hold on living till you feel better. Don’t be afraid. You will be surprised when she accepts your proposal. Lines picked from pop songs and movies might sound good, but they give you away as a fake. Instead of using pick-up lines, speak from the heart. Tell the girl exactly what you feel about her. She will appreciate you much better, than when you recite lines you’ve crammed. You might be the owner of a whole fleet of airplanes, but offering free drinks to a girl does not entitle you to a conversation. In case you do offer the drinks, ensure you keep cool. Any girl can tell your intentions from far off. So don’t buy her a drink to entice her into a conversation with you. Who knows, her motives might be as warped as yours. Only give her a smile and walk away, if she accepts your drink offer. The gesture should be enough to get her attention and leave her wondering what’s coming next. You have just spotted her walking in with a group of female friends. Without appearing too creepy or like a stalker, make your move. Walking past her may work. Alternatively, stand or sit opposite her and give her a few passing glances. Ensure you are not caught staring. Look at her long enough to get her attention without appearing to be overly interested. Smile when your eyes lock. You are bound to catch her attention. Keep looking her way, but do not approach her just yet. Maintain a level of mystery that keeps her interested and wondering what exactly is going on. Before you even approach and talk to her, write a note on the cocktail napkin and pass it to her. Love notes make girls go woozy. If your note ends with a question, the girl will know you are expecting to hear back from her. Alternatively, wave a simple hello. It looks innocent but rare. If she responds positively walk over to her and strike a conversation. If in distress, come to her rescue. Walk over to her and offer a hand if she slips. If, after striking eye contact, she looks interested, approach her. As you do, remember most ladies don’t like being overly overwhelmed by a man. Find the right opportunity and introduce yourself. Remember, she should be alone; not with her friends. Come up with something more creative than merely asking her name. Seek to maintain a sense of suspense that keeps her interested in the conversation. Meaningful conversations are those that go on for as long as an hour before names become part of it. It’s about the person, not the name! Telling her what you think first attracted her to you could be the best way to kick off a great conversation. Avoid using cliché lines such as constantly telling her how beautiful she is. Hell yeah, she already knows it! Just mention it and don’t keep insisting on the one point. The first thing you tell her should keep the conversation going! Telling her something about how mysterious she looks will raise questions thus sustaining a conversation. Avoid making her feel uncomfortable about the entire scenario. However, make your intentions clear. As the conversation winds on, play it cool. Looking over-interested is a total turn-off. Keep it open without any expectations. That way you are sure to kick off a great friendship and at the same time avoid disappointment if your expectations are not met. Do not touch her! At least not yet. You don’t want to appear like you are pushing yourself on her. Going physical too soon, you might be accused of sexual harassment, and you don’t want that. Waiting until you have the woman’s approval is the way to go. Nothing turns off a woman like a man who comes holding, randomly touching, or grinding against her. There are many ways to introduce yourself. Just don’t touch her, yet. There is not only one way to approach and flirt with a girl you like at a bar. Everyone has his own way as he has his own personality. The above tips are the most important things you should consider if you plan to approach a bar or club. 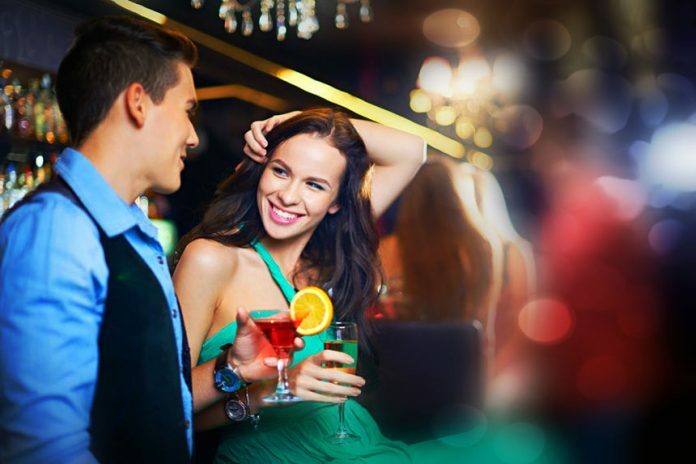 Try these tips to approach a girl at the bar and you’ll forever be grateful you did!